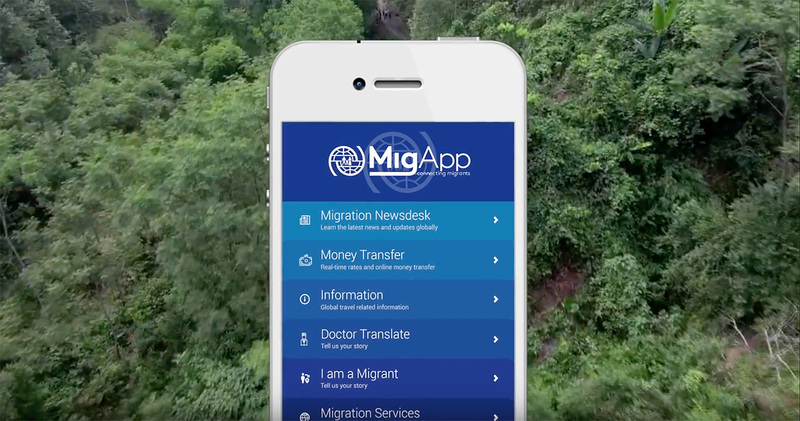 The International Organization for Migration launches MigApp. The new platform provides migrants with reliable information on risks, visa, health, rights and policies and offers a platform for exchange and sharing of experiences among migrants – as a convenient one-stop-shop. What are the possible risks en route? What are the health guidelines for migrants? Which are my rights and obligations? How do current government policies evolve? MigApp was launched in December 2017 and will provide as many answers to these questions as possible – all out of one source. In addition to this information, the app offers other services valuable to migrants and refugees. At present, irregular and unsafe migration is often a result of a lack of awareness about the risks involved in the migration process. Consequently, migrants often make ill-informed decisions regarding visa and travel regulations, health risks, and have limited or no interaction with legitimate service providers. Sending money is often important when travelling to or living in another country. Hence, MigApp aims to make remittances cheaper than before through money transfer comparison. The App also helps anyone who wants to return voluntarily to their country of origin. In its launch phase, MigApp will provide guidance on IOM’s return programme AVRR in five pilot countries: Belgium, Ireland, Turkey, Greece and the Netherlands. The app will also capture registration to health services for migrants in the following countries: Philippines, Jordan, Nigeria and Ukraine. Lastly, MigApp will also function as a secure space for its users to communicate and tell their story to each other and the world. They can also keep family and friends updated on their location. Hopefully, this will make life more difficult for illegal human traffickers and other people who take advantage of migrants and abuse them on their journey.